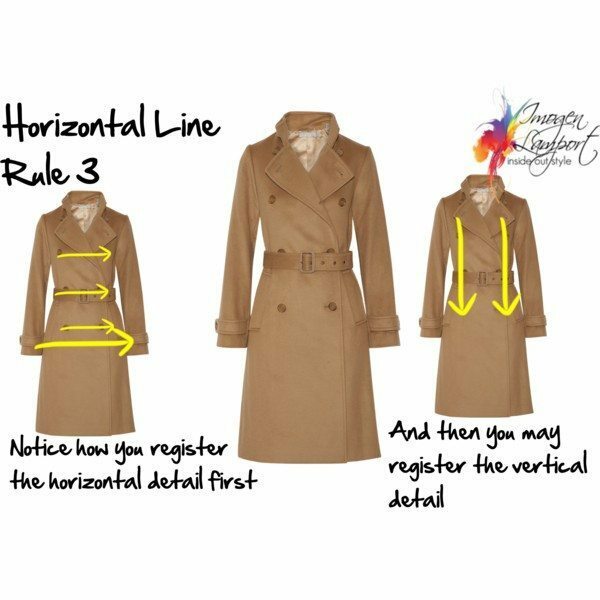 Before you take that garment into the change room, understanding the illusion of line really helps you choose clothes that flatter your figure. What kind of lines they are and where they sit on your body can make you look taller, shorter, wider and narrower. 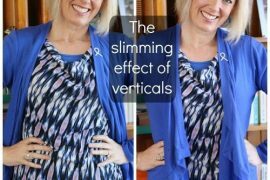 All the ‘rules’ on what to wear for each body shape really just relate back to the illusion of lines, and what they are doing to your body. Knowing how to use lines judiciously will give you a complete head-start when choosing what to take into the change room (whether that’s a virtual change room or a real one). Let’s discuss the power of the horizontal line. Never put a horizontal line on a body part you want to minimise or make look narrower. This includes hems, details and silhouette elements. The eye fills in the line. 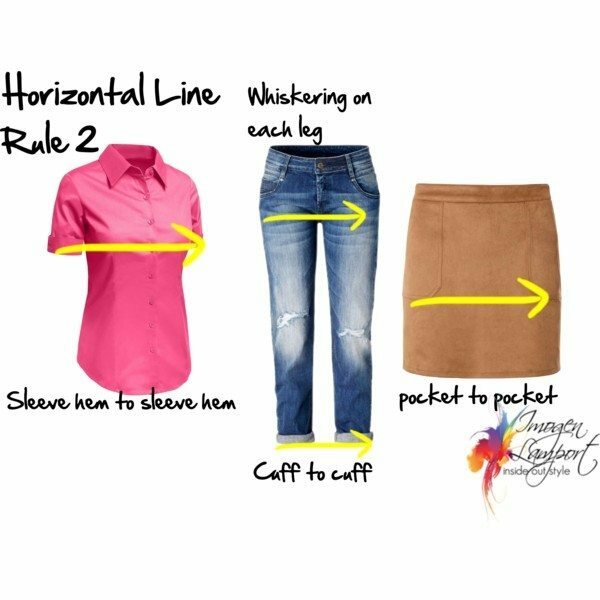 So two short horizontals can create one long horizontal across your body if they line up on a garments such pockets, sleeves, cuffs etc. We look for horizontal lines first. We we see something, we look for the horizontal line first as it gives us balance. So put horizontals on areas you want to broaden (to balance other areas) and take note of where horizontals fall on your body. So let’s put this knowledge into action. I often call this the “Where do I end My Hems” rule. Make sure your hems sit on the narrower parts of your body, unless you want to add extra curves to that area (and some of us do want to add extra curves!). 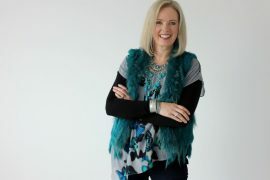 Remember there are hems on sleeves and pants as well as tops. Waistbands count as hems too! 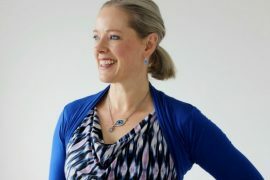 Some collars and necklines also create horizontal lines (such as boat necks). So if you don’t want to broaden your hips or thighs, don’t end tops at the widest points of your hips or thighs. If you don’t have a defined waist, don’t broaden it with a belt or obvious waistband. But, you can also use this rule to balance the wider parts of you. Want to balance your more curvaceous hips? Then add horizontal details to your shoulders. 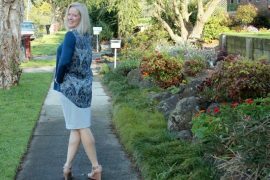 Want to make your square shoulders look narrower? Then add some horizontal details to your hips. You can decide what you want to broaden and choose to add a horizontal to this area. 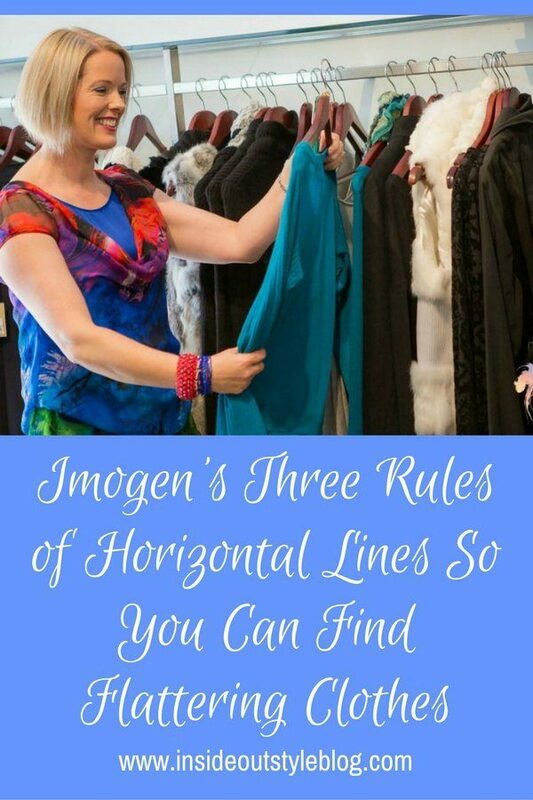 Find out more about the horizontal line rules for your body shape in your Body Shape Bible which you can do the quiz and download here. So our eyes keep on going and even if there is a short horizontal line, our eyes will fill in the gap between two short horizontals – such as sleeves, pockets and cuffs. So if you have a large bust, don’t wear tops that have sleeves ending at the fullest part of your bust. If you don’t want to add more width to your thighs, avoid jeans with whiskering at the crotch and pants or skirts with obvious pockets on the thighs. That is, before verticals, and those are the slimming lines! 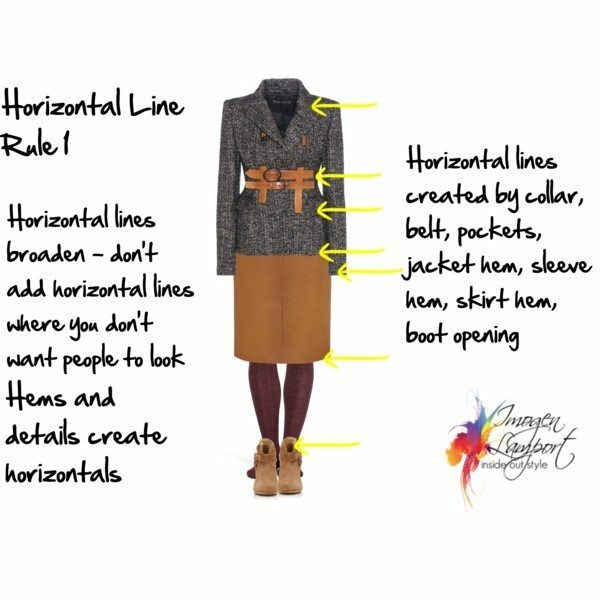 Yes we usually want to look for items that aren’t all covered in horizontal lines, we want to make sure we find a few vertical lines in our outfits (more on that here). But we see the horizontal lines first as we are always looking for the horizon as that gives us balance. 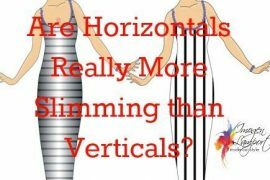 You want to be careful that your outfits aren’t ‘horizontal dominant’ if you are hoping to look either taller or slimmer. 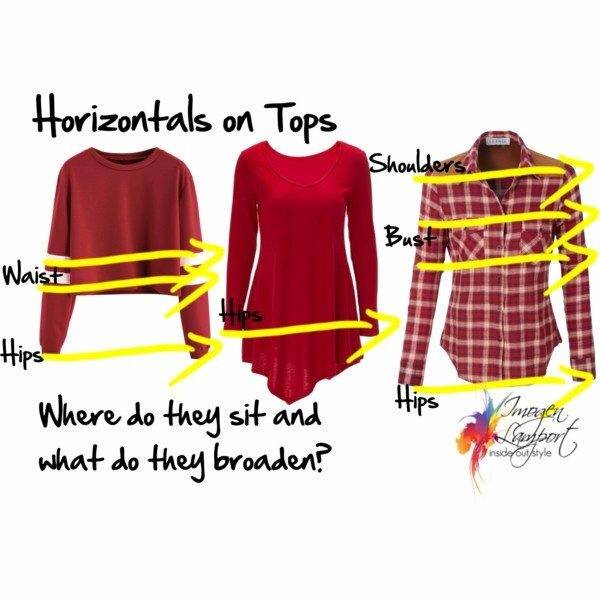 This is why we can also use the horizontal line to balance our body – it draws attention to where we want people to look as well! Now, just one little caveat! Not all horizontals are broadening! That’s right. When the horizontals are too fine for the eye to follow along one at a time, and when there are multiples of them, they can actually start working like a vertical line and become elongating. In fact it doesn’t matter the direction of the line. Wide stripes widen (particularly when there is an obvious change of colour). So before you take that garment into the change room, have a good look at it and decide where the horizontals are, and if you want them to fall on that part of your body! 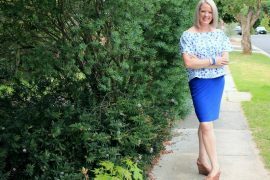 If you’re not sure about your body shape and would like my professional opinion, you get this as part of my 7 Steps to Style Program (along with personal colour analysis plus so much more to help you save money and develop your style). What a wonderful post with all those images which show the concept perfectly. 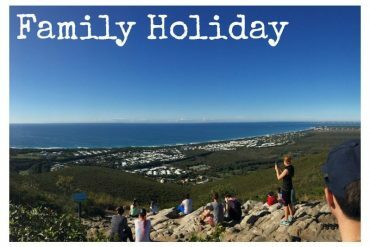 Could you do one for vertical lines with those kind of images as well? I know that you have the other elongation post but this post makes it even clearer. I agree with Tina, wonderfully illustrated!! 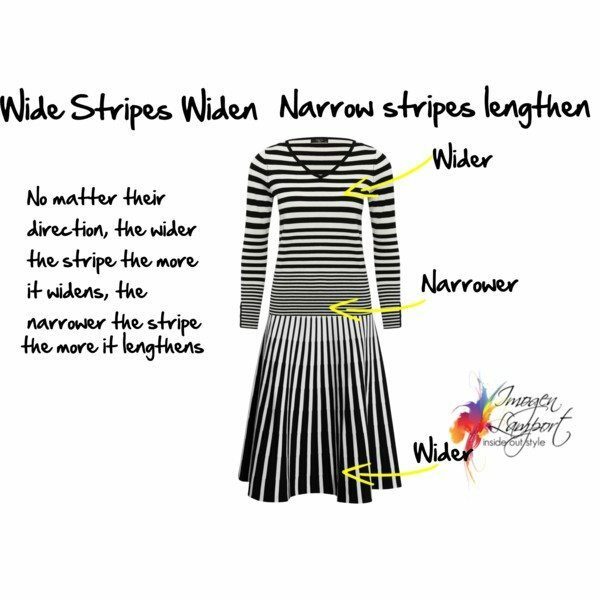 This is especially helpful for those if us trying to bring more color in our wardrobe without creating additional horizontal lines in unwanted places. If you decide to do another tutorial defining verticle lines would you consider featuring medium value colors without high contrast? Its so difficult to get this concept in place utilizing additional colors strategically. Thank you for this great post. I love the fact that you put arrows and explanations on your examples. Instead of just telling me not to end my jackets at the widest part of my hips, you have given me a proper reason. I now understand why something looks okay one time and not the next even though it is supposedly ‘my colour’ or ‘my style’. I sense another closet clean-out coming up. Very interesting! I tried something new. I have very sloping shoulders and usually wear long shirts because I thought it was in style. After considering the illustrations, I tucked in my shirt, as having a waistline is my asset. Amazing. My shoulders didn’t look so slope-y! Thanks to you, I’ve tried something new. I have very sloping shoulders and usually wear long shirts because I thought it was in style. After considering the illustrations, I tucked in my shirt, as having a waistline is my asset. Amazing. My shoulders didn’t look so slope-y! I am a rectangle body shape. I have 3 plaid shirts that I love the color and the look (on others). Everytime I put them on I take them off right away. My head looks like a baseball on top of a refrigerator. Now I know why. And, I can let go of trying to make the look work. Thanks , Imogene, for saving me from frown lines. Happy that you’fe figured it out for you! there is something that has been bothering me for a while. Do the ends of hair create a horizontal line? Depends how much you can see of it – this is why you don’t want to end a bob on a wider part of the face on the whole.